Qatif City is located in the Eastern Province of the Kingdom of Saudi Arabia. It lies on 50 N, and 26 E. Qatif is 20 kms north to Dammam – the capital of the eastern province-and 40 kms north to Dhahran, the capital of Saudi oil industry. It lies along the Persian Gulf, over Al-Qatif petroleum field and is bounded by the Bayadh Desert to the north. Qatif extends from Ras Tanura and Jubail in the north to Dammam in the south. It contains the city of Qatif, as well as several other towns and villages. Qatif is a historical coastal city located in Saudi Arabia’s Eastern Province. The history of Qatif goes back to 3500 BC in the late Bronze Age. Castles, citadels, ancient ruins and cemeteries are some of the examples illustrating the deep roots of Qatif’s history. While initially in modern day times reliant on agriculture fishing, Qatif is now famous and known in the oil industry and primarily due to the giant Qatif Oil Project. 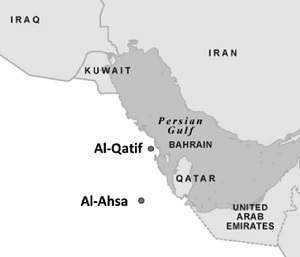 Thanks to its prominent location on the Gulf, Qatif dominated the Gulf trades between India (spices) and Europe. Trading ships stopped at Qatif’s port for food and water and trading negotiations. Prior to the Islamic revelation, Qatif was known for its war industry and bravery during wars. «Khutti Spears» were the pride of Qatif. Only strong and mighty knights would have these spears. Famous knights used these spears during battles and during tribal invasions. When Prophet Mohammad (A.S) started the Islamic Revelation, Qatif sent a delegation to the Prophet (A.S) and joined Islam. 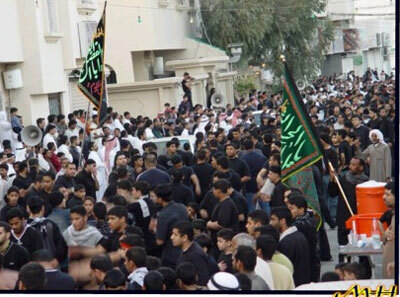 The Prophet (S.A) praised Qatif people for their strong faith and support to Islam. Qatif and its sister oasis Al-Hassa were known for their support to the Prophet and his clan (S.A). Since the early days of Islam, Qatif and Al-Hassa were known as Shiites Muslims due to their support to Ali (A.S) the son in law of the Prophet (A.S). Since then, Qatif majority population remained Shiites Muslims. Like millions of Shiites around the world, Qatif observes Ashura days (The first 10 days of Muharram, the first month in the Hijri Calendar). During Ashura all sorts of life will cease, and the whole region is dressed in black. During Ashura days, Qatif mourns the martyrdom of Imam Hussain (A.S) the grandson of Prophet Mohammad (A.S) and his family in the battle of Karbala. Men, women and children are all dressed in black. Qatif is located in the midst of one of the largest oases in the world. It is famous for its springs, palm trees and, of course, oil fields. After the discovery of oil, many residents sought employment with Saudi ARAMCO. Qatif’s economy is a mixture of agriculture and petroleum related activities. The agriculture was modernized in the 1960’s. Dates, alfalfa, rice, fruits, and vegetables are typical products. Tarut Citadel: Few origins of Tarut Citadel are not known for certain, except that it was built over 5000-year old settlements. Legends envisage a variety of historical images. The Citadel was built between 1515-1521 A.D. by the people of Qatif or Tarut for protection against Portuguese attackers. Another story is that the Portuguese built it for protection against Turkish attacks. After being forced to surrender in 1559 A.D., the Portuguese fled Tarut for the Island of Awal (Bahrain). Tarut Citadel is surrounded by a wide wall of terracotta material, gypsum, and stones. Crab-shaped in its totality, the 9-meter-high wall from bottom to top ranged between 1-2.5 meters in width. Bridges, over the entire length of the wall and connecting 11 high towers and abutments, were used as secret passages during wartime. Qasr Darin: Qasr Darin (also known as Qasr Abdul Wahhab Pasha) is an impressive structure overlooking the Arabian Gulf. In 1884, the wealthy Muhammad ibn Abdul Wahhab Al Fayhani came to the area from Qatar and built the castle over settlements, which date to the dawn of Islam. He traded in pearls, which were exported to many countries at that time. Fish Market: Qatif fishing port attracts catches from all ports of the Arabian Gulf. The Fish Market opens after sunset prayer and closes at 10:30 pm and it is the largest fish market in the region. Khamee’s Market: Every Thursday morning, Qatif bustles with the transactions of Khamee’s market, where stands are placed among regular stores and peddlers roam. A wide range of goods is available, with folkloric handicrafts, made during the week, displayed side-by-side modern imports. There are many discoveries in Qatif that go back to 3000 B.C; the most important one is Al-Rafea archaeological dig. The Al-Rafea dig is 1.5 km south-east of Taroot town. It contains many cemeteries. A Denmark mission made some surveys in 1964 in TAROOT and found some early tools. Some of them date back as early as 3000 B.C, such as some unscripted pots. Scripted stones show Samarian art, and some stamps were also found.